Metabolic profiling has given one Ceredigion lamb producer the ability to meet the exact needs of his ewes ahead of lambing. Farmers Guardian reports. In order to be able to rectifiy any dietary shortfalls in their flock, Rhuan and Nerys Williams from Ochor, near Tregaron, have carried out metabolic profiling on their ewes this year. The Williams’ run a flock of 550 commercial ewes, including 250 Improved Welsh Mountain ewes and 300 Welsh Mules. Around 120 ewe lambs are kept for breeding. The farm is a demonstration farm, which is part of the Government-funded Farming Connect programme. Vet Jim Hopkins, of Steffan Veterinary Services, Lampeter, led the sampling and said metabolic profiling is the only effective method of checking a diet is matched to a pregnant ewe’s requirements. Deficiencies in the diet can result in insufficient and poor-quality colostrum, poor milk production and an increased risk of twin-lamb disease and hypocalcaemia. Mr Hopkins says: “If a ewe is short of protein this can have a major impact on lamb growth. The pre-lambing diet at Ochor is based on high quality silage with an ME content of 11.8MJ/kg dry matter (DM), crude protein of 151 and 64.5 per cent DM. This is balanced with minerals, whole barley and soya. For twin and triplet-bearing ewes, the ration consists of 20g minerals, 150g of whole barley and 200g soya. 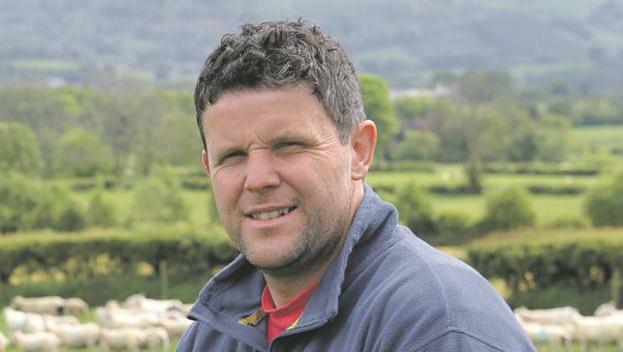 Last year, this worked out at just over £4 per ewe, but Mr Williams hopes to further reduce costs this year as soya and barley have reduced in price. The final cost will also depend on the spring weather and how much needs to be fed post-turnout. The Williams’ were keen to know if the ewes were getting all their requirements from the ration ahead of lambing in March and April. Mr Williams explains: “One of our main objectives as a Farming Connect demonstration farm is to make the business more efficient. In-lamb ewes can appear to be doing well on their diet but they could have shortfalls in energy and protein, even if there are no clinical signs, warns Mr Hopkins. He took samples from single, twin and triplet-bearing ewes to give an accurate picture of overall performance. Results from the metabolic profile were very positive, showing the ewes had the desired energy balance and protein and mineral levels and no changes to the diet were needed. “The ewes are doing well on the ration, it will put them in a good place for rearing their lambs,’’ says Mr Hopkins. Metabolic profiling involves taking a blood sample and measuring a ketone called 3-hydroxybutyrate (BHOB). The level of BHOB in the blood indicates whether the ewe is receiving enough nutrition to ensure sufficient production of colostrum and the birth of healthy lambs of normal birthweight. The profile also checks levels of magnesium and copper. It costs around £100 plus the vet’s time to take the blood samples. Mr Hopkins recommends metabolic profiling as a routine pre-lambing procedure. “Three weeks before lambing is the ideal point to blood sample as it allows time for the diet to be adjusted and any issues to be corrected,” he says. Mr Hopkins advises farmers to get their silage analysed so the ration can be balanced against it.